Divide-and-conquer and playing one opponent against another might sound like shrewd Art of War strategies, but they can land you in the midst a crossfire. Frankly, there is no safe place to be in Johnnie To’s Drug War (trailer here). The HK action auteur’s lean, mean return to form screens today at the 2013 New York Asian Film Festival just ahead of its July 26th New York opening, courtesy of Well Go USA, the intrepid distributor getting a special shout-out at this year’s festival with their own special programming spotlight. “I’m cop—I didn’t betray you, I busted you.” Captain Zhang Lei’s choice words for the somewhat disappointed drug courier he just collared will echo throughout To’s first gangster throwdown set and co-produced in Mainland China. Zhang also reeled in a bigger fish: Timmy Choi, a meth lab proprietor and trusted liaison between various criminal factions. Facing the death penalty, Choi agrees to play ball with Zhang. He will introduce Zhang to Brother Haha, a distribution kingpin looking for product and the representative of a shadowy supply consortium. At each meeting, Zhang pretends to be the opposite gangster, in hopes of taking down both operations simultaneously. He is not absolutely, positively sure he can trust Choi, but it is too good an opportunity to pass up. Unusually gritty compared to the operatic Vengeance and Exiled, the first two acts of Drug War are essentially street-level procedurals, but darn good ones. To shows us the nuts and bolts of the Tianjin drug squad at work, as well as the extreme lengths Zhang will go to take down his targets. However, when it is finally go time, Drug War erupts into cold, hard, violent bedlam. As Zhang, Sun Honglei is the absolute essence of hard-nosed steeliness. Initially, it is rather jarring to hear him giggling in the guise of Haha, put he pulls that off too. Likewise, Louis Koo will make viewers forget all about his recent leading man rom-com roles in his coldest, weasliest performance in years, even if he was dubbed for Mandarin speaking audiences. His Choi is truly a survivor, like a cockroach. To fans will also being relieved to hear Lam Suet eventually turns up, as a criminal mastermind, no less. Aside from a bit of comic relief here and there, the soldier-like supporting cast sets the right tone, particularly the glammed-down, nonsense Crystal Huang as Zhang’s colleague, Yang Xiabei. The massively cool Drug War does not just pack a punch. It is more like a body slam. Critics and fans were concerned whether To’s hardboiled brand of crime drama would fly in China, but somehow he slipped this pitch black gem past the Party goalie. 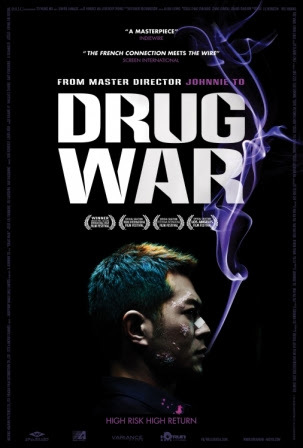 A case of a master filmmaker and an all-star cast working at the tops of their respective games, Drug War is very highly recommended for action and gangster movie enthusiasts. It screens today (7/5) at the Walter Reade Theater as part of this year’s NYAFF and opens its regular IFC Center engagement for the Fest feted Well Go USA on Friday the 26th.